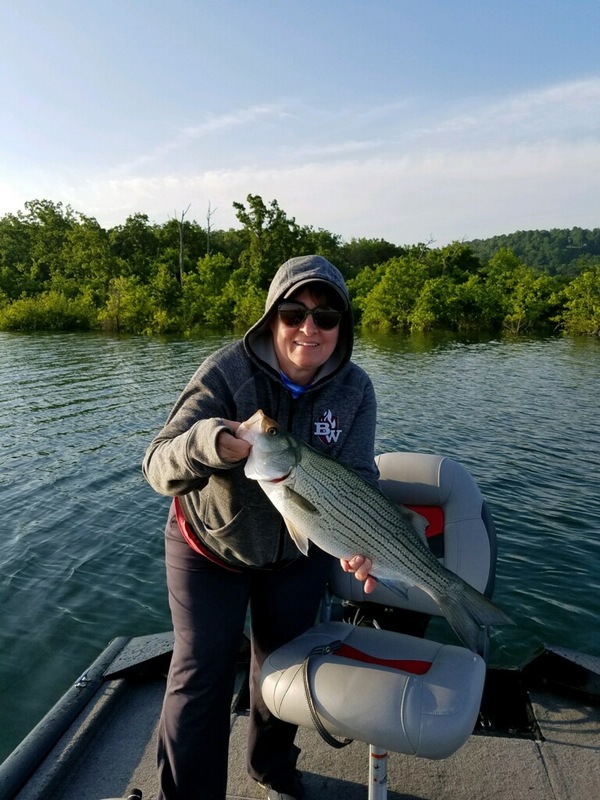 It has been a real roller coaster ride on Norfork Lake for the past 2 weeks. On April 29 the lake started to rise until it reached the top of the flood pool. Missouri had devastating floods which eventually ended up in Norfork Lake. The lake became muddy from north to south, but the muddy water is finally starting to fall out and the lake is stable. The high water will be with us for quite a while, but high water is not a bad thing. Most species had completed their spawn prior to the high water so the newly born fry will have plenty of places to hide making future fishing even better. 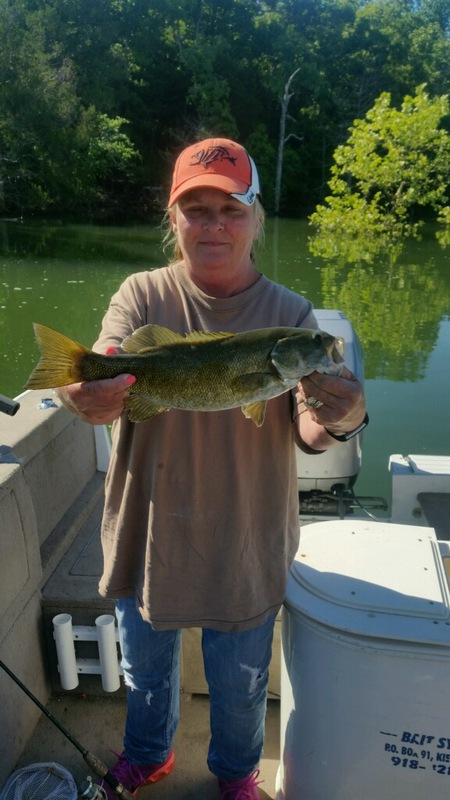 Fishing will continue to improve daily over the whole lake as the mud settles out and the water turns to a great stained color for fishing. 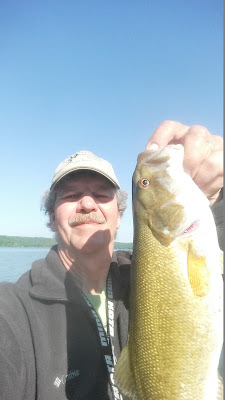 I have traveled most of the lake over the last week and have found good fishing water starting in the midlake area down to the dam. It appears that the brown water is falling out from the backs of the creeks and working its way out to the main lake. The farther south you travel on the main lake the clearer the water gets. Overall the fish are on the shoreline inside of the newly sunken brush and trees. Live bait has been working exceptionally well. Threadfin shad and large shiners are both working. I have been using a number 6 kahle hook with no weight and pitching the bait into openings between the trees. I have also been moving slowly right outside the trees in about 15 - 20 feet of water and dragging the baits behind the boat, again with no weight. Today I was fishing on a point down in the dam area and hooked into a big fish. The fish started to run for deep water and I knew I had a big striper. This fish came very close to spooling me. After about a 20 minute battle, I landed a 40 inch 30 pound striped bass. 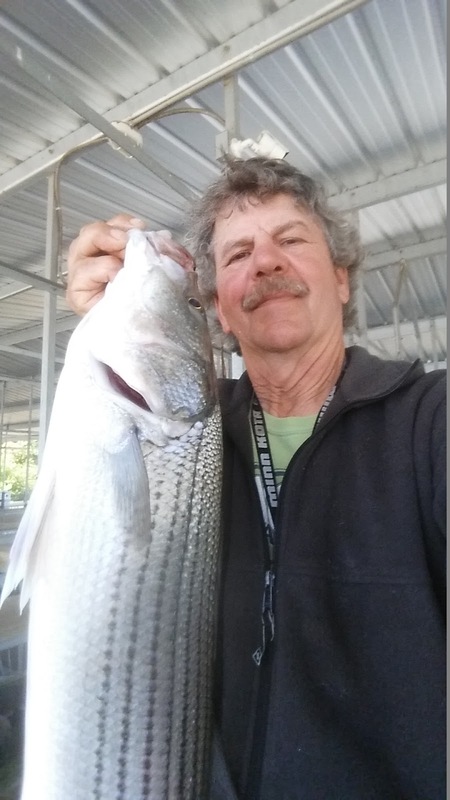 I was only using a 7 foot medium light action rod with a spinning reel filled with 8 pound monofilament line. Light tackle makes the battle a lot of fun. Friday I fished the midlake major creeks. I was about half way back in a creek where the water became clear to stained. I fished channel swing points pitching live bait up in the brush. I was fishing with several of my guests and we landed almost every species in the lake. I have also been using some artificial baits. Today I landed a nice striper on a 5 inch swim bait with a 3/8 ounce jig head. I cast the bait into opening and try to get it as close to the new shore as possible and then reel back to the boat. Jerk baits, either soft plastics or hard baits will also be working well up in the brush. The best bite for me is early morning. I've been told that the afternoon bite seems to be slow. 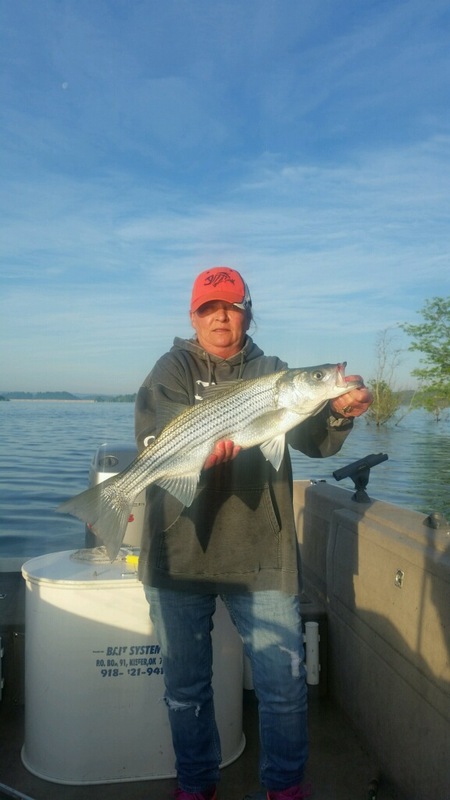 As our lake water warms look for the stripers to move away from the shoreline and go to a little deeper water. 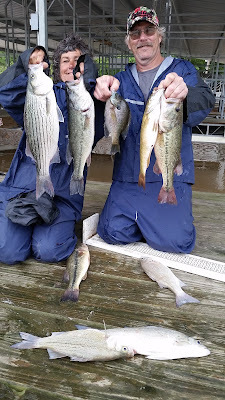 Monday morning a couple of our guests found some really good topwater action for striped bass. They got to their fishing spot and could see the fish exploding as they approached. Once the topwater stopped they put away their Zara spooks and proceeded to pitch live bait into the shore and continued to catch fish. 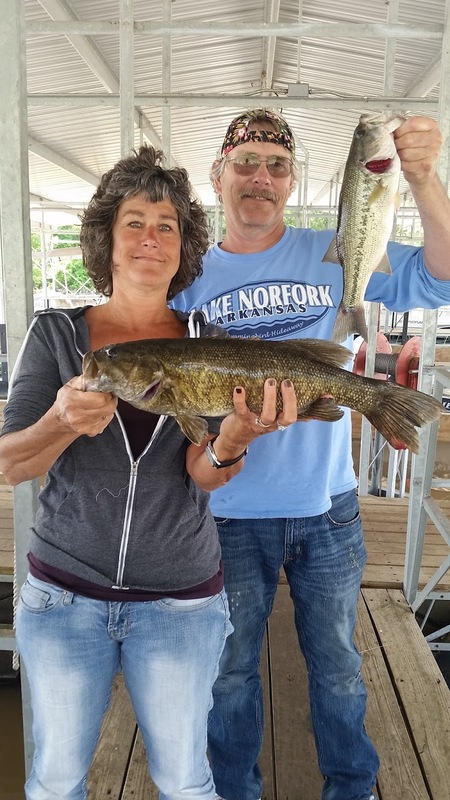 Largemouth, smallmouth and spotted bass fishing is also improving. These species are located in the same areas as the striped bass, you will find them inside of the sunken brush and trees. I have had the best luck catching fish by finding sunken buck brush in about 10 to 15 feet depths, letting my bait sink down to the tops of the brush and then working it back to the boat. I have caught many fish on the fall of the bait. Creature baits worked along the brush will pick up some nice fish. Again find the stained to clear water and start fishing. I have not heard anything about crappie, but I am sure they are inside of the brush feeding on shad. You may need to pull out your 12 foot long cane pole to be able to get to the crappie inside of the brush along the banks . The Norfork Lake level is holding steady at 577.03. The Corps of Engineers is running all generators for the major part of the day to keep up with the inflow and hold the lake stable. The water surface temperature is in the low 70's. The lake is muddy (but clearing slowly) from the Robinson area to the Cranfield area and up river, as well as from from the bridges up to the Bennetts area. The lake is stained, a little south of the Robinson area and continues to become clearer the farther south you go. There is still floating debris in the lake, mainly concentrated around the Mallard Point area though Cranfield and up river as well as back in the Fouts area. We are to have a strong South wind so a lot of this debris will be pushed to the shore until a north wind or no wind happens. As always, be careful when on the lake.